Congratulations to "LibraryPat" and "Kim H.", the winners in Anne's giveaway. Thank you to all who participated! It was a bit puzzling, that Chief Inspector Acton hadn’t mentioned the body they’d discovered in the burnt-out church, even though he must have known that Doyle would be extremely interested. Was the arsonist caught up in her own fire, or was there a deeper, more sinister tale told by the blackened rubble? Although she was sidelined on maternity leave, Detective Sergeant Kathleen Doyle was fast coming to the realization that her husband hadn’t told her because he was masterminding some scheme—a scheme that may-or-may-not involve arson, blood money, and the ducks of St. Petersburg. That night, Doyle had one of her dreams. She had them, occasionally—only they weren’t truly very dream-like; instead, they usually featured some person—oftentimes a dead person—who was trying to convey some sort of message. The message never seemed to be straightforward, and the dreams were—truth to tell—a bit frustrating, because the message invariably concerned some dire event that was unfolding or about to unfold, and Doyle always felt as though she wasn’t quite up to the task of deciphering whatever it was that she was supposed to be deciphering. Nonetheless, she was never anxious or frightened by these dreams; mainly, she was resigned to paying attention, even though it was never very easy. This time, the person who confronted her was entirely unexpected; the small, slight figure of a priest smiled at her benignly. His hands were clasped before him, and he appeared to be of an Asian race—Pacific Islander, perhaps. “Oh, no,” the priest shook his head, slightly. “No.” He smiled his serene smile, and didn’t seem motivated to continue the conversation. “What’s happened to you?” This seemed the appropriate gambit to get the dire-warnings conversation started; she had some sleep to catch, in miserable snatches, and this fellow was breaking up her fitful rhythm. But instead of hearing an answer, she found that she was staring at her darkened bedroom wall, and listening to the sound of her accelerated heartbeat, echoing in her ears. 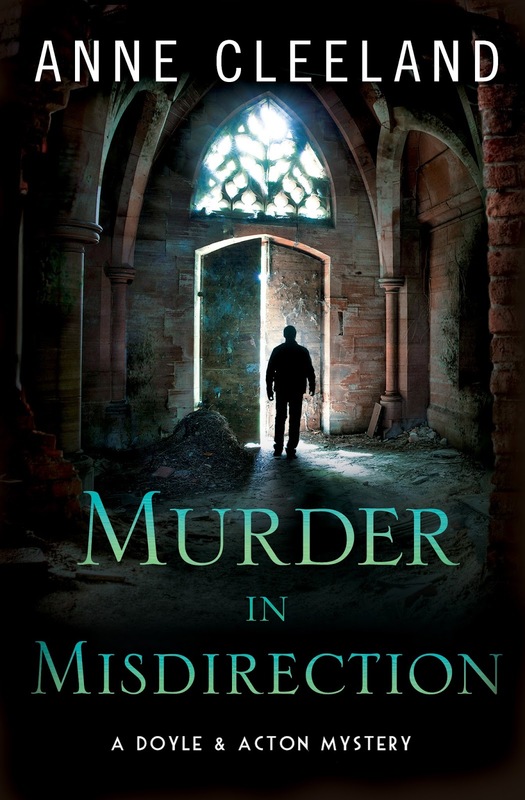 Anne will be giving away 2 signed copies of MURDER IN MISDIRECTION to two lucky people leaving a comment or email entry. This sounds like a fabulous read. Dreams or "visions" of things that could or have happened can and do happen. It would certainly be much easier for Detective Sergeant Kathleen Doyle if they were a bit more clear and not as cryptic. Should be an interesting story. One of my favorite series and it just keeps getting better!